We are located on level three at Yeovil Hospital, on the left just beyond reception. It is essential that you read the relevant information as soon as you receive your appointment for any of the procedures below. Some require preparation or specific diets for five days before your appointment. On admission to the department your height and weight will be taken as well as a set of baseline observations, (blood pressure, pulse, etc). The nurse will then check your details, including what procedure you are having and if preparation has been completed. We will also check and confirm your contact details, past medical history and next of kin information. The nurse will then give you a consent form to read through whilst waiting for your procedure and, if applicable, a change of clothing, (gown/paper pants). The endoscopist will then ensure consent is given for your procedure. An endoscopy nurse will then come and collect you for your procedure and answer any questions you may have. The nursing staff will do their best to keep you updated of any changes or delays to the clinic timings. We undertake approximately 7,000 procedures a year and aim to give a high quality of care for patients and relatives in a friendly and safe environment where knowledge, privacy, dignity and respect are our ultimate goals. As we are an outpatient service, visiting is not appropriate. Patients can be dropped off and collected when their procedure has been undertaken. If you have any concerns, please let a member of staff know and they will be happy to help you. Chargeable parking is available opposite the hospital, also 20 minute spaces available in front of the hospital. Click here for more parking details and how to get here. The current Joint Advisory Group on Gastrointestinal Endoscopy (JAG) accreditation scheme was established in 2005 and, along with the Global Rating Scale (GRS), has supported endoscopy services across the UK to focus on standards and identify areas for development. The scheme is regarded as one of the most innovative and effective in the healthcare sector, and has been used as a model and source of inspiration for similar schemes both here and overseas. Improving Performance – the standard serves as an authoritative benchmark for assessing performance, rewarding achievements in the service and driving quality improvement. 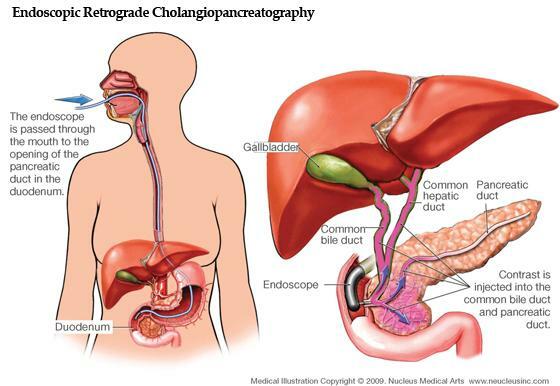 ERCP is where an endoscope is passed through your mouth down to where the bile duct opens into the small intestine. However, during ERCP the opening of the bile duct is widened with a small incision or an electrically heated wire. The bile duct stones are then removed or left to pass into your intestine and out of your body. Sometimes a small tube called a stent is permanently placed in the bile duct to help the bile and stones pass. An ERCP is usually carried out under sedation, which means you’ll be awake throughout the procedure but won’t experience any pain. The ERCP procedure lasts about 30 minutes on average, but can take from 15 minutes to over an hour. You may need to stay overnight in hospital after the procedure so you can be monitored. For NHS details about Irritable Bowel Syndrome, click here. Do I need to eat different foods prior procedure? Low residue/fibre diet should be adhered to for five days prior to a colonoscopy, this is because a clear view of the bowel is required to ensure nothing is missed. Seeds should especially be avoided as this can block the scope and you may need to have the procedure repeated. Further information can be found in colonoscopy leaflet. As a diabetic do I need to do anything different prior to procedure? Follow the dietary advice as above, when making your appointment ensure it is early in the day. Follow guidance in the ‘diabetes and your procedure’ leaflet for medication advice, if unsure contact the day surgery ward on 01935 384339 for additional advice. I am taking blood thinning medication– for example: warfarin, aspirin, clopidogrel, dabigatran, rivaroxaban, should I continue to do so? If taking warfarin an INR check will be required, please arrange to have this done the day before at your GP surgery. If taking any other blood thinning medication please contact the endoscopy office on 01935 384 793 for guidance. What bowel preparation do I need to do prior to procedure? If having a colonoscopy you will be sent your bowel prep in the post– please follow the directions exactly to ensure the best outcome for the procedure. You will also be required to be nil by mouth once bowel prep is commenced. If having a flexible sigmoidoscopy an enema will be sent in the post for self administration (if you are unable to self administer arrangements can be made to have it administered by a nurse prior to the procedure on the ward). The enema needs to be administered a couple of hours prior to your appointment. What types of pain relief can you have? Throat spray is the first choice you can have. It is an anaesthetic liquid sprayed into the back of your mouth and numbs the throat for 30 mins. You are able to go home within 30 mins of the procedure. Sedation is the other option. It is called ‘conscious sedation’. You will not be asleep, it is different from general anaesthetic. You will have a needle put into your arm or hand in order to give you the sedation. You will not be able to leave for at least an hour after the procedure and you need someone to collect you and be with you for 12 hours after the procedure. You cannot drive/ work or make important decisions for 24 hours post procedure. Most people do not need pain relief for this procedure but you can have Entonox, it is a mixture of nitrous oxide and oxygen. It is very effective and leaves the body within seconds so you can go home quickly. Some people manage quite well without any analgesia but analgesia is available. Inhaled sedation (a mixture of nitrous oxide and oxygen) is offered, this gives you control over how much is taken. Intravenous sedation is the other pain relief given (please see above for information). Can I still have sedation if I’m taking a controlled drug or strong pain relief medications? Any concerns can be addressed over the telephone prior to the procedure. Or can be discussed with the endoscopist on the day. If I have sedation for my procedure when can I start breastfeeding? If you have intravenous sedation, it is advised not to breastfeed for 24 hours after it has been administered. Why am I having these tests? The tests can be diagnostic or therapeutic. Diagnostic could be testing for anaemia, swallowing difficulties, and changes in bowel habit. Sometimes the endoscopist will take small tissue samples (biopsies) to confirm a diagnosis, these samples are sent to the lab and usually take about two weeks for the results. Therapeutic can be removing small tissue growths called polyps. Can I have a friend / someone with me? You may have someone with you and sit in reception until you are called in. Only in very exceptional circumstances can we allow visitors onto the ward. Is my appointment time the time of my procedure? No, this is your arrival time. This allows for your admission and consent to be completed prior to the procedure, as well as allowing time to change in to a gown if required. What happens if my appointment gets cancelled? Should the need arise to cancel your appointment another will be booked and confirmation will be sent. Is it ok wear makeup/ jewellery/nails ? You may wear makeup and nails, although it is preferable not to have the colour red on your nails. You will be asked to remove some jewellery should it affect the safety of the procedure, for example removing a tongue piercing if having a gastroscopy. Do I need to stop some of my medications? Consult with your GP or contact the ward for advice on stopping any medications. Can I fly after my procedure? It is advisable not to fly for two weeks following a colonoscopy and/or removal of a polyp, this can be discussed with the endoscopist, or contact the ward if concerned. I’ve not been very well is it still ok to come to my appointment? Contact the ward and discuss your concerns prior to the appointment day. How long does it take for the biopsy results to come back? Approximately two weeks., the results will be forwarded to you GP unless you have a follow-up appointment with the consultant. This varies from patient to patient and whether or not sedation was administered. You can resume normal daily routines once you feel well enough to do so, however following sedation you will be recovered in the department for a couple of hours and will be unable to drive or return to work for 24 hours and must have someone with you at all times for the first 12 hours. You are able to resume your normal eating habits once the procedure is completed unless advised differently by the endoscopist. Where is the endoscopy department? 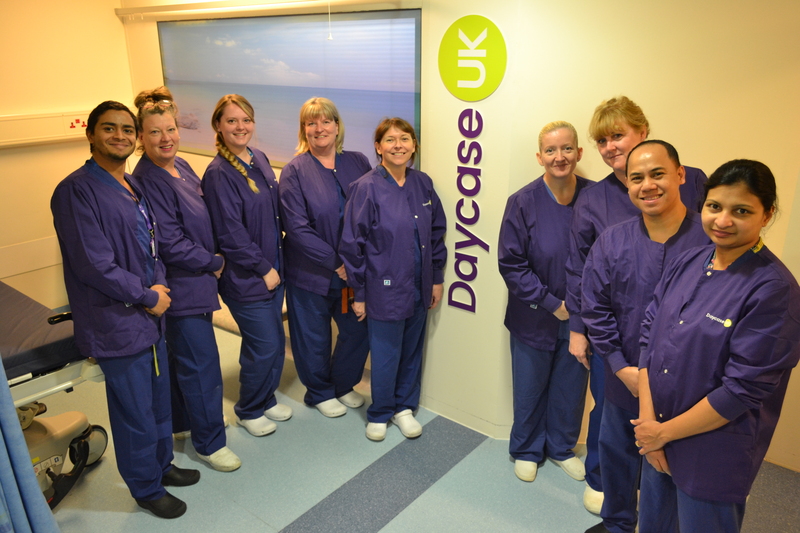 The Day Case UK endoscopy department can be found on level 3 (this is the level where the main reception is found), it is based left of reception just before the coffee area.